This fall the University of North Carolina at Chapel Hill earned silver status from the League of American Bicyclists’ Bicycle Friendly Universities 2018 ranking. UNC-Chapel Hill is one of only 16 universities to receive this year’s silver designation, which will remain for four years. The strongest aspects of Carolina’s application included the Commuter Alternative Program, the Cyclicious Week of Welcome event, the interactive bike map and the implementation of the bike share program, Tar Heel Bikes. The Towns of Chapel Hill and Carrboro are currently ranked as Bronze and Silver Bicycle Friendly Communities, respectively. The League of American Bicyclists sets the national standard for bicycling promotion and safety training and works with universities, communities and businesses to find ways they can expand programs for bicyclists. 193 universities have been labeled “bicycle friendly” since 2011. Each applicant must complete a comprehensive audit of more than 100 data points followed by a call for input from local cyclists. This is the second time UNC-Chapel Hill has received the silver designation. One of the most significant changes to biking at Carolina in the last four years has been the implementation of the bike share program, Tar Heel Bikes. Having just celebrated its first year on campus, Tar Heel Bikes already boasts more than 30,129 miles ridden, offsetting more than 26 thousand pounds of carbon. It the first year of the bike share program, UNC-Chapel Hill accommodated more than 5,000 members, as well as guest bicyclists who have used the program. While the idea for a bikeshare program began with students, the support of the Advisory Committee on Transportation and Parking made the program and funding possible as part of the recommendations of the Five-Year Plan. 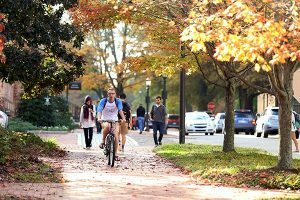 Carolina plans to continue improving resources for bicyclists across campus and looks forward to applying again for Bicycle Friendly University rankings in four years, and developing opportunities for members of campus to find alternative options for transportation.